This article is about the type of housing. For other uses, see Apartment (disambiguation). For other uses of the abbreviation "apt. ", see Apt. (disambiguation). An apartment (American English), flat (British English) or unit (Australian English) is a self-contained housing unit (a type of residential real estate) that occupies only part of a building, generally on a single storey. There are many names for these overall buildings, see below. The housing tenure of apartments also varies considerably, from large-scale public housing, to owner occupancy within what is legally a condominium (strata title or commonhold), to tenants renting from a private landlord (see leasehold estate). Both words refer to a self-contained residential unit with its own front door, kitchen, toilet, and bathroom. In some parts of the world, the word apartment refers to a purpose-built unit in a building, whereas the word flat means a converted unit in an older building, usually a big house. In other places the terms are interchangeable. The term apartment is favored in North America (although in some cities flat is used for a unit which is part of a house containing two or three units, typically one to a floor). In the UK, the term apartment is more usual in professional real estate and architectural circles where otherwise the term flat is used commonly, but not exclusively, for an apartment on a single level (hence a 'flat' apartment). In some countries the word "unit" is a more general term referring to both apartments and rental business suites. The word 'unit' is generally used only in the context of a specific building; e.g., "This building has three units" or "I'm going to rent a unit in this building", but not "I'm going to rent a unit somewhere". Some buildings can be characterized as 'mixed use buildings', meaning part of the building is for commercial, business, or office use, usually on the first floor or first couple of floors, and one or more apartments are found in the rest of the building, usually on the upper floors. Tenement law refers to the feudal basis of permanent property such as land or rents. It may be found combined as in "Messuage or Tenement" to encompass all the land, buildings and other assets of a property. In the United States, some apartment-dwellers own their units, either as co-ops, in which the residents own shares of a corporation that owns the building or development; or in condominiums, whose residents own their apartments and share ownership of the public spaces. 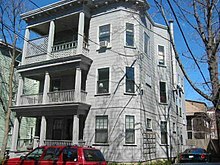 Most apartments are in buildings designed for the purpose, but large older houses are sometimes divided into apartments. The word apartment denotes a residential unit or section in a building. In some locations, particularly the United States, the word connotes a rental unit owned by the building owner, and is not typically used for a condominium. 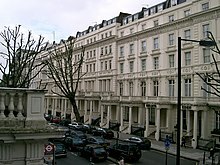 In England and Wales, some flat owners own shares in the company that owns the freehold of the building as well as holding the flat under a lease. This arrangement is commonly known as a "share of freehold" flat. The freehold company has the right to collect annual ground rents from each of the flat owners in the building. The freeholder can also develop or sell the building, subject to the usual planning and restrictions that might apply. This situation does not happen in Scotland, where long leasehold of residential property was formerly unusual, and is now impossible. Bachelor apartment, one-bedroom, etc. ; see below. Apartment buildings are multi-story buildings where three or more residences are contained within one structure. Such a building may be called an apartment building, apartment complex, flat complex, block of flats, tower block, high-rise or, occasionally, mansion block (in British English), especially if it consists of many apartments for rent. A high-rise apartment building is commonly referred to as a residential tower, apartment tower, or block of flats in Australia. A high-rise building is defined by its height differently in various jurisdictions. 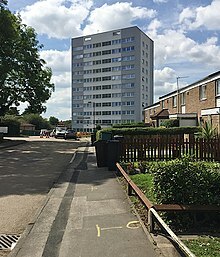 It may be only residential, in which case it might also be called a tower block, or it might include other functions such as hotel, offices, or shops. There is no clear difference between a tower block and a skyscraper, although a building with fifty or more stories is generally considered a skyscraper. High-rise buildings became possible with the invention of the elevator (lift) and cheaper, more abundant building materials. Their structural system usually is made of reinforced concrete and steel. A low-rise building and mid-rise buildings have fewer storeys, but the limits are not always clear. Emporis defines a low-rise as "an enclosed structure below 35 metres [115 feet] which is divided into regular floor levels." 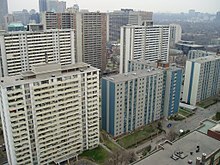 The city of Toronto defines a mid-rise as a building between 4 and 12 stories. In American English, the distinction between rental apartments and condominiums is that while rental buildings are owned by a single entity and rented out to many, condominiums are owned individually, while their owners still pay a monthly or yearly fee for building upkeep. Condominiums are often leased by their owner as rental apartments. A third alternative, the cooperative apartment building (or "co-op"), acts as a corporation with all of the tenants as shareholders of the building. Tenants in cooperative buildings do not own their apartment, but instead own a proportional number of shares of the entire cooperative. As in condominiums, cooperators pay a monthly fee for building upkeep. Co-ops are common in cities such as New York, and have gained some popularity in other larger urban areas in the U.S. In British English the usual word is "flat", but apartment is used by property developers to denote expensive 'flats' in exclusive and expensive residential areas in, for example, parts of London such as Belgravia and Hampstead. In Scotland, it is called a block of flats or, if it is a traditional sandstone building, a tenement, a term which has a negative connotation elsewhere. Australian English and New Zealand English traditionally used the term flat (although it also applies to any rental property), and more recently also use the terms unit or apartment. In Australia, a 'unit' refers to flats, apartments or even semi-detached houses. In Australia, the terms "unit", "flat" and "apartment" are largely used interchangeably. Newer high-rise buildings are more often marketed as "apartments", as the term "flats" carries colloquial connotations. The term condominium or condo is rarely used in Australia despite attempts by developers to market it. In South African English, an apartment is usually a single level rental area that is a part of a larger building and can be entered from inside the building through a separate door leading off either a wind tunnel or entrance hall/lobby that is shared with other occupants of the building. In Malaysian English, flat often denotes a housing block of two rooms with walk-up, no lift, without facilities, typically five storeys tall, and with outdoor parking space, while apartment is more generic and may also include luxury condominiums. In Japanese English loanwords (Wasei-eigo), the term apartment (apaato) is used for lower-income housing and mansion (manshon) is used for high-end apartments; but both terms refer to what English-speakers regard as an apartment (or condominium) and not the level of luxury of a mansion in English parlance. See Housing in Japan. Danchi is the Japanese word for a large cluster of apartment buildings of a particular style and design, typically built as public housing by government authorities. The smallest self-contained apartments are referred to as studio, efficiency or bachelor apartments in the US, or studio flat in the UK. These units usually consist of a large single main room which acts as the living room, dining room and bedroom combined and usually also includes kitchen facilities, with a separate bathroom. 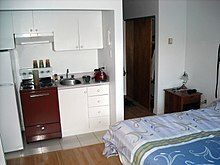 In Korea, the term "one room" (wonroom) refers to a studio apartment. Merriam-Webster defines a garden apartment in American English as "a multiple-unit low-rise dwelling having considerable lawn or garden space" The apartment buildings are often arranged around courtyards that are open at one end. Such a garden apartment shares some characteristics of a townhouse: each apartment has its own building entrance, or shares that entrance via a staircase and lobby that adjoins other units immediately above and/or below it. Unlike a townhouse, each apartment occupies only one level. Such garden apartment buildings are almost never more than three stories high, since they typically lack elevators. However, the first "garden apartment" buildings in New York, USA, built in the early 1900s, were constructed five stories high. Some garden apartment buildings place a one-car garage under each apartment. The interior grounds are often landscaped. Georgian terraced townhouses. The black railings enclose the basement areas, which in the twentieth century were converted to garden flats. The Oxford English Dictionary defines the use of "garden flat" in British English as "a basement or ground-floor flat with a view of and access to a garden or lawn", although its citations acknowledge that the reference to a garden may be illusory. "Garden flat" can serve simply as a euphemism for a basement. The large Georgian or Victorian townhouse was built with an excavated subterranean space around its front known as an area, often surrounded by cast iron railings. This lowest floor housed the kitchen, the main place of work for the servants, with a "tradesman's entrance" via the area stairs. This "lower ground floor" (another euphemism) has proven ideal for conversion to a self-contained "garden flat". One American term for this arrangement is an English basement. Generally on the lowest floor of a building. When part of a house is converted for the ostensible use of the owner's family member, the self-contained dwelling may be known as an "in-law apartment", "annexe", or "granny flat", though these (sometimes illegally) created units are often occupied by ordinary renters rather than the landlord's relative. In Canada these are commonly located below the main house and are therefore "basement suites". Another term is an "accessory dwelling unit", which may be part of the main house, or a free-standing structure in its grounds. Salon apartment is a term linked to the exclusive apartments built as part of multi-family houses in Belgrade and in certain towns in Yugoslavia in the first decades of the 20th century. The structure of the apartments included centrally located anteroom with a combined function of the dining room and one or more salon areas. Most of these apartments were built in Belgrade (Serbia), along with the first examples of apartments popularly named 'salon apartments', with the concept of spatial and functional organization later spreading to other larger urban centers in Yugoslavia. "Maisonette" redirects here. For other uses, see Maisonette (disambiguation). Maisonette (a corruption of 'maisonnette', from the French word for "little house") has no strict definition, but the OED suggests "A part of a residential building which is occupied separately, usually on more than one floor and having its own outside entrance." It differs from a flat in having, usually, more than one floor, with a staircase internal to the dwelling leading from the entrance floor to the upper (or, in some cases, lower) other floor. This is a very common arrangement in much post-War British public housing, serving both to reduce costs by reducing the amount of space given to access corridors and to emulate the 'traditional' two-storey terrace house to which many of the residents would have been accustomed. A maisonette could encompass Tyneside flats, pairs of single-storey flats within a two-storey terrace. Their distinctive feature is their use of two separate front doors onto the street, each door leading to a single flat. "Maisonette" could also stretch to cottage flats, also known as 'Four-in-a-block flats', a style of housing common in Scotland. The vast majority of apartments are on one level, hence "flat". Some, however, have two storeys, joined internally by stairs, just as many houses do. One term for this is "maisonette", as above. Some public housing in the United Kingdom was designed as scissor section flats. On a grander level, penthouses may have more than one storey, to emphasise the idea of space and luxury. Two storey units in new construction are sometimes referred to as "townhouses". A triple-decker in New England. "Duplex" refers to two separate units with a common demising wall or floor-ceiling assembly. Duplex description can be different depending on the part of the country but generally has two to four dwellings with a door for each and usually two front doors close together but separate - referred to as 'duplex' indicating the number of units, not the number of floors, as in some areas of the country they are often only one story. In the United States, regional forms have developed, see vernacular architecture. In Milwaukee, a Polish flat or "raised cottage" is an existing small house that has been lifted up to accommodate the creation of a basement floor housing a separate apartment, then set down again, thus becoming a modest pair of dwellings. In the Sun Belt, boxy small apartment buildings called dingbats, often with carports below, sprang up from the 1950s. Groups of more than two units have corresponding names (Triplex, etc.). Those buildings that have a third storey are known as triplexes. See Three-decker (house). This type of apartment developed in North America during the middle of the 20th century. The term initially described a living space created within a former industrial building, usually 19th century. These large apartments found favor with artists and musicians wanting accommodation in large cities (New York for example) and is related to unused buildings in the decaying parts of such cities being occupied illegally by people squatting. These loft apartments were usually located in former highrise warehouses and factories left vacant after town planning rules and economic conditions in the mid 20th century changed. The resulting apartments created a new bohemian lifestyle and are arranged in a completely different way from most urban living spaces, often including workshops and art studio spaces. As the supply of old buildings of a suitable nature has dried up developers have responded by constructing new buildings in the same aesthetic with varying degrees of success. An industrial, warehouse, or commercial space converted to an apartment is commonly called a loft, although some modern lofts are built by design. An apartment located on the top floor of a high-rise apartment building. In Russia, a communal apartment («коммуналка») is a room with a shared kitchen and bath. A typical arrangement is a cluster of five or so room-apartments with a common kitchen and bathroom and separate front doors, occupying a floor in a pre-Revolutionary mansion. Traditionally a room is owned by the government and assigned to a family on a semi-permanent basis. A "serviced apartment" is any size space for residential living which includes regular maid and cleaning services provided by the rental agent. Serviced apartments or serviced flats developed in the early part of the 20th century and were briefly fashionable in the 1920s and 30s. They are intended to combine the best features of luxury and self-contained apartments, often being an adjunct of a hotel. Like guests semi-permanently installed in a luxury hotel, residents could enjoy the additional facilities such as house keeping, laundry, catering and other services if and when desired. A feature of these apartment blocks was quite glamorous interiors with lavish bathrooms but no kitchen or laundry spaces in each flat. This style of living became very fashionable as many upper-class people found they could not afford as many live-in staff after the First World War and revelled in a "lock-up and leave" life style that serviced apartment hotels supplied. Some buildings have been subsequently renovated with standard facilities in each apartment, but serviced apartment hotel complexes continue to be constructed. Recently a number of hotels have supplemented their traditional business model with serviced apartment wings, creating privately owned areas within their buildings - either freehold or leasehold. Apartments may be available for rent furnished, with furniture, or unfurnished into which a tenant moves in with their own furniture. Serviced apartments, intended to be convenient for shorter stays, include soft furnishings and kitchen utensils, and maid service. Laundry facilities may reside in a common area accessible to all building tenants, or each apartment may have its own facilities. Depending on when the building was built and its design, utilities such as water, heating, and electricity may be common for all of the apartments, or separate for each apartment and billed separately to each tenant. (Many areas in the US have ruled it illegal to split a water bill among all the tenants, especially if a pool is on the premises.) Outlets for connection to telephones are typically included in apartments. Telephone service is optional and is almost always billed separately from the rent payments. Cable television and similar amenities also cost extra. Parking space(s), air conditioning, and extra storage space may or may not be included with an apartment. Rental leases often limit the maximum number of residents in each apartment. On or around the ground floor of the apartment building, a series of mailboxes are typically kept in a location accessible to the public and, thus, to the mail carrier. Every unit typically gets its own mailbox with individual keys to it. Some very large apartment buildings with a full-time staff may take mail from the mailman and provide mail-sorting service. Near the mailboxes or some other location accessible by outsiders, a buzzer (equivalent to a doorbell) may be available for each individual unit. In smaller apartment buildings such as two- or three-flats, or even four-flats, rubbish is often disposed of in trash containers similar to those used at houses. In larger buildings, rubbish is often collected in a common trash bin or dumpster. For cleanliness or minimizing noise, many lessors will place restrictions on tenants regarding smoking or keeping pets in an apartment. 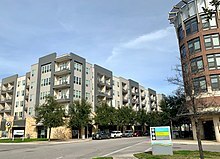 Mid-rise One-plus-five style apartment buildings in Austin, Texas. In more urban areas, apartments close to the downtown area have the benefits of proximity to jobs and/or public transportation. However, prices per square foot are often much higher than in suburban areas. Small apartments often have only one entrance. Large apartments often have two entrances, perhaps a door in the front and another in the back, or from an underground or otherwise attached parking structure. Depending on the building design, the entrance doors may be connected directly to the outside or to a common area inside, such as a hallway or a lobby. In many American cities, the One-plus-five style of mid-rise, wood-framed apartments have gained significant popularity following a 2009 revision to the International Building Code; these buildings typically feature four wood-framed floors above a concrete podium and are popular with developers due to their high density and relatively lower construction costs. The Puebloan peoples of what is now the Southwestern United States have constructed large, multi-room dwellings, some comprising more than 900 rooms, since the 10th century. In the Classic Period Mesoamerican city of Teotihuacan, apartments were not only the standard means of housing the city's population of over 200,000 inhabitants, but show a remarkably even wealth distribution for the entire city, even by contemporary standards. Furthermore, the apartments were inhabited by the general populace as a whole, in contrast to other Pre-Modern socieites, where apartments were limited to housing the lower class members of the society, as with the somewhat contemporary Roman insulae. In ancient Rome, the insulae (singular insula) were large apartment buildings where the lower and middle classes of Romans (the plebs) dwelled. The floor at ground level was used for tabernas, shops and businesses, with living space on the higher floors. Insulae in Rome and other imperial cities reached up to ten or more stories, some with more than 200 stairs. Several emperors, beginning with Augustus (r. 30 BC-14 AD), attempted to establish limits of 20–25 m for multi-storey buildings, but met with only limited success. The lower floors were typically occupied by either shops or wealthy families, while the upper stories were rented out to the lower classes. Surviving Oxyrhynchus Papyri indicate that seven-story buildings even existed in provincial towns, such as in 3rd century Hermopolis in Roman Egypt. During the medieval Arabic-Islamic period, the Egyptian capital of Fustat (Old Cairo) housed many high-rise residential buildings, some seven stories tall that could reportedly accommodate hundreds of people. In the 10th century, Al-Muqaddasi described them as resembling minarets, and stated that the majority of Fustat's population lived in these multi-storey apartment buildings, each one housing more than 200 people. In the 11th century, Nasir Khusraw described some of these apartment buildings rising up to fourteen stories, with roof gardens on the top storey complete with ox-drawn water wheels for irrigating them. By the 16th century, the current Cairo also had high-rise apartment buildings, where the two lower floors were for commercial and storage purposes and the multiple stories above them were rented out to tenants. High-rise apartment buildings were built in the Yemeni city of Shibam in the 16th century. The houses of Shibam are all made out of mud bricks, but about 500 of them are tower houses, which rise 5 to 11 stories high, with each floor having one or two apartments. Shibam has been called "Manhattan of the desert". Some of them were over 100 feet (30 m) high, thus being the tallest mudbrick apartment buildings in the world to this day. The Hakka people in southern China adopted communal living structures designed to be easily defensible, in the form of Weilongwu (围龙屋) and Tulou (土楼). The latter are large, enclosed and fortified earth buildings, between three and five stories high and housing up to eighty families. In London, by the time of the 2011 census, 52 per cent of all homes were flats. Many of these were built as Georgian or Victorian houses and subsequently divided up. Many others were built as council flats. Many tower blocks were built in the UK after the Second World War. A number of these have been demolished and replaced with low-rise buildings or housing estates. In the late 19th and early 20th centuries, the concept of the flat was slow to catch on amongst the British middle classes, which generally followed the north European standard of single-family houses dating far back into history. Those who lived in flats were assumed to be lower class and somewhat itinerant, renting for example a "flat above a shop" as part of a lease agreement for a tradesman. In London and most of Britain, everyone who could afford to do so occupied an entire house – even if this was a small terraced house - while the working poor continued to rent rooms in often overcrowded properties, with one (or more) families per room. During the last quarter of the 19th century, as wealth increased, ideas began to change. Both urban growth and the increase in population meant that more imaginative housing concepts would be needed if the middle and upper classes were to maintain a pied-à-terre in the capital. The traditional London town house was becoming increasingly expensive to maintain. For bachelors and unmarried women in particular, the idea of renting a modern mansion flat became increasingly popular. Albert Mansions, which Philip Flower constructed and James Knowles designed. These flats were constructed between 1867 and 1870, and were one of the earliest blocks of flats to fill the vacant spaces of the newly-laid out Victoria Street at the end of the 1860s. Today, only a sliver of the building remains, next to the Victoria Palace Theatre. Albert Mansions was really 19 separate "houses", each with a staircase serving one flat per floor. Its tenants included Sir Arthur Sullivan and Lord Alfred Tennyson, whose connections with the developer's family were long-standing. Philip Flower's son, 1st Baron Cyril Flower Battersea, developed most of the mansion blocks on Prince of Wales Drive, London. Albert Hall Mansions, designed by Richard Norman Shaw in 1876. Because this was a new type of housing, Shaw reduced risks as much as possible; each block was planned as a separate project, with the building of each part contingent on the successful occupation of every flat in the previous block. The gamble paid off and was a success. In Scotland, the term "tenement" lacks the pejorative connotations it carries elsewhere, and refers simply to any block of flats sharing a common central staircase and lacking an elevator, particularly those constructed before 1919. Tenements were, and continue to be, inhabited by a wide range of social classes and income groups. Tenements today are bought by a wide range of social types, including young professionals, older retirees, and by absentee landlords, often for rental to students after they leave halls of residence managed by their institution. The National Trust for Scotland Tenement House (Glasgow) is a historic house museum offering an insight into the lifestyle of tenement dwellers, as it was generations ago. During the 19th century tenements became the predominant type of new housing in Scotland's industrial cities, although they were very common in the Old Town in Edinburgh from the 15th century, where they reached ten or eleven storeys and in one case fourteen storeys. 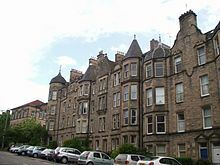 Built of sandstone or granite, Scottish tenements are usually three to five storeys in height, with two to four flats on each floor. (In contrast, industrial cities in England tended to favour "back-to-back" terraces of brick.) Scottish tenements are constructed in terraces, and each entrance within a block is referred to as a close or stair—both referring to the shared passageway to the individual flats. Flights of stairs and landings are generally designated common areas, and residents traditionally took turns to sweep clean the floors, and in Aberdeen in particular, took turns to make use of shared laundry facilities in the "back green" (garden or yard). It is now more common for cleaning of the common ways to be contracted out through a managing agent or "factor". In Glasgow, where Scotland's highest concentration of tenement dwellings can be found, the urban renewal projects of the 1950s, 1960s and 1970s brought an end to the city's slums, which had primarily consisted of older tenements built in the early 19th century in which large extended families would live together in cramped conditions. They were replaced by high-rise blocks that, within a couple of decades, became notorious for crime and poverty. The Glasgow Corporation made many efforts to improve the situation, most successfully with the City Improvement Trust, which cleared the slums of the old town, replacing them with what they thought of as a traditional high street, which remains an imposing townscape. (The City Halls and the Cleland Testimonial were part of this scheme.) National government help was given following World War I when Housing Acts sought to provide "homes fit for heroes". Garden suburb areas, based on English models, such as Knightswood, were set up. These proved too expensive, so a modern tenement, three stories high, slate roofed and built of reconstituted stone, was re-introduced and a slum clearance programme initiated to clear areas such as the Calton and the Garngad. Post Second World War, more ambitious plans, known as the Bruce Plan, were made for the complete evacuation of slums to modern mid-rise housing developments on the outskirts of the city. However, central government refused to fund the plans, preferring instead to depopulate the city to a series of New Towns. Again, economic considerations meant that many of the planned "New Town" amenities were never built in these areas. These housing estates, known as "schemes", came therefore to be widely regarded as unsuccessful; many, such as Castlemilk, were just dormitories well away from the centre of the city with no amenities, such as shops and public houses ("deserts with windows", as Billy Connolly once put it). High rise living too started off with bright ambition—the Moss Heights, built in the 1950s, are still desirable—but fell prey to later economic pressure. Many of the later tower blocks were poorly designed and cheaply built and their anonymity caused some social problems. The demolition of the tower blocks in order to build modern housing schemes has in some cases led to a re-interpretations of the tenement. In 1970 a team from Strathclyde University demonstrated that the old tenements had been basically sound, and could be given new life with replumbing providing modern kitchens and bathrooms. The Corporation acted on this principle for the first time in 1973 at the Old Swan Corner, Pollokshaws. Thereafter, Housing Action Areas were set up to renovate so-called slums. 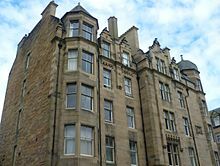 Later, privately owned tenements benefited from government help in "stone cleaning", revealing a honey-coloured sandstone behind the presumed "grey" tenemental facades. The policy of tenement demolition is now considered to have been short-sighted, wasteful and largely unsuccessful. Many of Glasgow's worst tenements were refurbished into desirable accommodation in the 1970s and 1980s and the policy of demolition is considered to have destroyed fine examples of a "universally admired architectural" style. The Glasgow Housing Association took ownership of the public housing stock from the city council on 7 March 2003, and has begun a £96 million clearance and demolition programme to clear and demolish many of the high-rise flats. Blind Man's Alley bear its name for a reason. Until little more than a year ago its dark burrows harbored a colony of blind beggars, tenants of a blind landlord, old Daniel Murphy, whom every child in the ward knows, if he never heard of the President of the United States. "Old Dan" made a big fortune--he told me once four hundred thousand dollars-- out of his alley and the surrounding tenements, only to grow blind himself in extreme old age, sharing in the end the chief hardship of the wretched beings whose lot he had stubbornly refused to better that he might increase his wealth. Even when the Board of Health at last compelled him to repair and clean up the worst of the old buildings, under threat of driving out the tenants and locking the doors behind them, the work was accomplished against the old man's angry protests. He appeared in person before the Board to argue his case, and his argument was characteristic. "I have made my will," he said. "My monument stands waiting for me in Calvary. I stand on the very brink of the grave, blind and helpless, and now (here the pathos of the appeal was swept under in a burst of angry indignation) do you want me to build and get skinned, skinned? These people are not fit to live in a nice house. Let them go where they can, and let my house stand." In spite of the genuine anguish of the appeal, it was downright amusing to find that his anger was provoked less by the anticipated waste of luxury on his tenants than by distrust of his own kind, the builder. He knew intuitively what to expect. The result showed that Mr. Murphy had gauged his tenants correctly. Many campaigners, such as Upton Sinclair and Jacob Riis, pushed for reforms in tenement dwellings. As a result, the New York State Tenement House Act was passed in 1901 to improve the conditions. More improvements followed. In 1949, President Harry S. Truman signed the Housing Act of 1949 to clean slums and reconstruct housing units for the poor. The Dakota (1884) was one of the first luxury apartment buildings in New York City. The majority, however, remained tenements. Some significant developments in architectural design of apartment buildings came out of the 1950s and '60s. Among them were groundbreaking designs in the 860-880 Lake Shore Drive Apartments (1951), New Century Guild (1961), Marina City (1964) and Lake Point Tower (1968). In the United States, "tenement" is a label usually applied to the less expensive, more basic rental apartment buildings in older sections of large cities. Many of these apartment buildings are "walk-ups" without an elevator, and some have shared bathing facilities, though this is becoming less common. 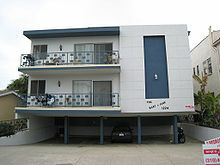 The slang term "dingbat" is used to describe cheap urban apartment buildings from the 1950s and 1960s with unique and often wacky façades to differentiate themselves within a full block of apartments. They are often built on stilts, and with parking underneath. Class A properties are luxury units. They are usually less than 10 years old and are often new, upscale apartment buildings. Average rents are high, and they are generally in desirable geographic areas. White-collar workers live in them and are usually renters by choice. Class B properties can be 10 to 25 years old. They are generally well maintained and have a middle class tenant base of both white and blue-collar workers. Some are renters by choice, and others by necessity. Class C properties were built within the last 30 to 40 years. They generally have blue-collar and low- to moderate-income tenants, and the rents are below market. Many tenants are renters "for life". On the other hand, some of their tenants are just starting out and are likely to work their way up the rental scale as their income rises. Class D properties house many Section 8 (government-subsidized) tenants. They are generally located in lower socioeconomic areas. Apartments were popular in Canada, particularly in urban centres like Vancouver, Toronto, Ottawa, Montreal, and Hamilton, Ontario in the 1950s to 1970s. By the 1980s, many multi-unit buildings were being constructed as condominiums instead of apartments, and both are now very common. In Toronto and Vancouver, high-rise apartments and condominiums have been spread around the city, giving even the major suburbs a skyline. 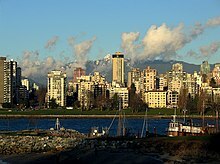 The robustness of the condo markets in Toronto and Vancouver are based on the lack of land availability. The average cap rate in the Greater Toronto Area for Q3 2015 hit its lowest level in the last 30 years. The cap rate in Q3 2015 stood at 3.75 per cent, down from 4.2 per cent in Q2 2015 and down almost 50 per cent from the 6.3 per cent posted in Q3 2010. The skyline of the Gold Coast in Queensland is dominated by apartments. The Canterbury in St Kilda, Victoria is one of the earliest surviving apartment buildings in Australia. 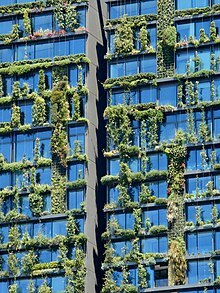 Apartment buildings in Australia are typically managed by a body corporate or "owners corporation" in which owners pay a monthly fee to provide for common maintenance and help cover future repair. Many apartments are owned through strata title. Due to legislation, Australian banks will either apply loan to value ratios of over 70 per cent for strata titles of less than 50 square metres, the big four Australian banks will not loan at all for strata titles of less than 30 square metres. These are usually classified as studio apartments or student accommodation. Australian legislation enforces a minimum 2.4m floor-ceiling height which differentiates apartment buildings from office buildings. In Australia, apartment living is a popular lifestyle choice for DINKY, yuppies, university students and more recently empty nesters, however, rising land values in the big cities in recent years has seen an increase in families living in apartments. In Melbourne and Sydney apartment living is sometimes not a matter of choice for the many socially disadvantaged people who often end up in public housing towers. Australia has a relatively recent history in apartment buildings. Terrace houses were the early response to density development, though the majority of Australians lived in fully detached houses. Apartments of any kind were legislated against in the Parliament of Queensland as part of the Undue Subdivision of Land Prevention Act 1885. The earliest apartment buildings were in the major cities of Sydney and Melbourne as the response to fast rising land values–both cities are home to the two oldest surviving apartment buildings in the country, Kingsclere in Potts Point, and The Canterbury Flats in St Kilda. Melbourne Mansions on Collins Street, Melbourne (now demolished), built in 1906 for mostly wealthy residents is believed by many to be the earliest. Today the oldest surviving self-contained apartment buildings are in the St Kilda area including the Fawkner Mansions (1910), Majestic Mansions (1912 as a boarding house) and the Canterbury (1914 - the oldest surviving buildings contained flats). Kingsclere, built in 1912 is believed to be the earliest apartment building in Sydney and still survives. 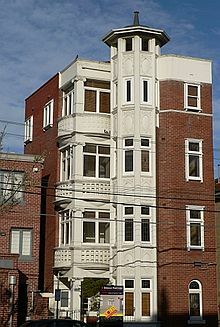 During the interwar years, apartment building continued in inner Melbourne (particularly in areas such as St Kilda and South Yarra), Sydney (particularly in areas such as Potts Point, Darlinghust and Kings Cross) and in Brisbane (in areas such as New Farm, Fortitude Valley and Spring Hill). Post-World War II, with the Australian Dream apartment buildings went out of vogue and flats were seen as accommodation only for the poor. Walk-up flats (without a lift) of two to three storeys however were common in the middle suburbs of cities for lower income groups. The main exceptions were Sydney and the Gold Coast, Queensland where apartment development continued for more than half a century. In Sydney a limited geography and highly sought after waterfront views (Sydney Harbour and beaches such as Bondi) made apartment living socially acceptable. While on the Gold Coast views of the ocean, proximity to the beach and a large tourist population made apartments a popular choice. Since the 1960s, these cities maintained much higher population densities than the rest of Australia through the acceptance of apartment buildings. In other cities, apartment building was almost solely restricted to public housing. Public housing in Australia was common in the larger cities, particularly in Melbourne (by the Housing Commission of Victoria) where a huge number of hi-rise housing commission flats were built between the 1950s and 1970s by successive governments as part of an urban renewal program. Areas affected included Fitzroy, Flemington, Collingwood, Carlton, Richmond and Prahran. Similar projects were run in Sydney's lower socio economic areas like Redfern. In the 1980s, modern apartment buildings sprang up in riverside locations in Brisbane (along the Brisbane River) and Perth (along the Swan River). In Melbourne, in the 1990s, a trend began for apartment buildings without the requirement of spectacular views. 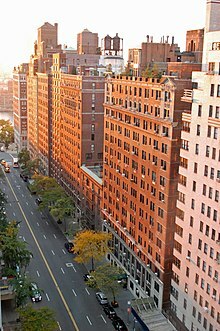 As a continuation of the gentrification of the inner city, a fashion became New York "loft" style apartments (see above) and a large stock of old warehouses and old abandoned office buildings in and around the central business district became the target of developers. The trend of adaptive reuse extended to conversion of old churches and schools. Similar warehouse conversions and gentrification began in Brisbane suburbs such as Teneriffe, Queensland and Fortitude Valley and in Sydney in areas such as Ultimo. As supply of buildings for conversion ran out, reproduction and post modern style apartments followed. The popularity of these apartments also stimulated a boom in the construction of new hi-rise apartment buildings in inner cities. This was particularly the case in Melbourne which was fuelled by official planning policies (Postcode 3000), making the CBD the fastest growing, population wise in the country. Apartment building in the Melbourne metropolitan area has also escalated with the advent of the Melbourne 2030 planning policy. Urban renewal areas like Docklands, Southbank, St Kilda Road and Port Melbourne are now predominantly apartments. There has also been a sharp increase in the number of student apartment buildings in areas such as Carlton in Melbourne. Despite their size, other smaller cities including Canberra, Darwin, Townsville, Cairns, Newcastle, Wollongong, Adelaide and Geelong have begun building apartments in the 2000s. Today, residential buildings Eureka Tower and Q1 are the tallest in the country. In many cases, apartments in inner city areas of the major cities can cost much more than much larger houses in the outer suburbs. Some Australian cities, such as Gold Coast, Queensland, are inhabited predominantly by apartment dwellers. The development of residential architecture in Yugoslavia during the period of socialism had its peak in the 1960s and 1970s. Significant progress in construction was accompanied by housing research directed towards finding the optimal urbanistic solutions for the newly formed lifestyle of the socialist society. The tendency was to “pack” as many residential units as possible into each building, almost up to the limits of the functional minimum, at the same time with the aim of setting a more humane pattern of living. As a consequence of these aspirations, the following concepts emerged, making the core of housing research: (a) apartments with an extended circulation area, (b) apartments with a central sanitary core, (c) apartments with a circular connection and (d) apartments with extended perspectives (“an enfilade”). These “socialist” ideas for the organization of living space had a firm base in theoretical research and underwent the phase of testing in architectural competitions, housing seminars and congresses, which made them spread over the whole territory of the country. The process of humanizing housing was not characteristic only in the Yugoslav context, similar ideas also appeared in other socialist countries of that period, as in the example of pre-fabricated housing construction in the Soviet Union (Khrushchyovka), Czechoslovakia (Panelák), Hungary (Panelház) and East Germany (Plattenbau). ^ "Long Leases (Scotland) Act 2012". UK Legislation. 2012. Retrieved 9 March 2015. ^ "Data Standards: Structures - low-rise building". Emporis Standards. Retrieved June 10, 2009. ^ Categories of Homes in Malaysia. ^ "'Konglish' Not Spoken Here: Asia Society Korea Center Targets Signs and Schoolbooks". Asia Society. 11 October 2012. Retrieved 5 February 2015. ^ "Private renting: Houses in multiple occupation - GOV.UK". www.gov.uk. Retrieved 16 April 2018. ^ "Garden apartment". Merriam-Webster Dictionary. Retrieved 29 August 2018. ^ Hogan, Meghan. Eden in the City Preservation Magazine online, 2006-09-22. Article on preservation of early United States garden apartment buildings. ^ "Housing in Gateshead" (PDF). Gateshead Council. 2006. ^ McMurray, Sally, ed. (2000). People, Power, Places (1st ed.). Knoxville: University of Tennessee Press. p. 40. ISBN 9781572330757. ^ "Naherholung gleich ums Eck" (in German). www.terrafinanz.de. Retrieved 17 June 2013. ^ Sissom, Patrick (December 4, 2018). "Why do all new apartment buildings look the same?". Curbed. Retrieved February 23, 2019. ^ Jarus, Owen. "Teotihuacan: Ancient City of Pyramids". Livescience. Livescience. Retrieved 19 March 2016. ^ Smith, Michael E. "Living the good life in Teotihuacan". Retrieved 19 March 2016. ^ "Teotihuacan". Mexican History. Retrieved 19 March 2016. ^ a b Gregory S. Aldrete: "Daily Life in the Roman City: Rome, Pompeii and Ostia", 2004, ISBN 978-0-313-33174-9, p.79f. ^ Glasgow announces a revolution in house-building Wednesday 31 May 2006. ^ Riis, Jacob A. (1890). How the other half lives : studies among the tenements of New York (1st ed.). New York: Charles Scribner's Sons. pp. 31–32. ISBN 9111562986. Retrieved 2 January 2017. ^ Wang, Sissi (8 July 2015). "The latest threat to the condo market: apartment buildings rise again". Canadian Business. Retrieved 17 October 2015. ^ DiGianfelice, Lorenzo (9 October 2015). "GTA cap rate hits new benchmark low". Canadian Apartment Magazine. Retrieved 17 October 2015. ^ Peterson, Richard (2005). "The Canterbury (Flats) - 236 Canterbury Road, St Kilda West" (PDF). A Place of Sensuous Resort: Buildings of St Kilda and Their People. St Kilda Historical Society. Retrieved 17 October 2015. ^ "High Rise has a past too". Heritage.nsw.gov.au. Archived from the original on 28 June 2002. Retrieved 2008-11-25. ^ Lojanica, V., Ristić, J., Međo, V. (2011) Multi–family Housing Architecture in Belgrade: Models and Development, in Proceedings from the International Conference on Architecture and Design INTERCAD. Vienna: Technical University, pp. 5-13. ^ Kulić, V. (2012) Architecture and Ideology in Socialist Yugoslavia, in Mrduljaš, M. and Kulić, V. (eds.) Unfinished Modernisations: Between Utopia and Pragmatism. Zagreb: UHA/CCA, pp. 36-63.; Alfirević Đorđe, Simonović Alfirević Sanja. „Urban Housing Experiments in Yugoslavia 1948-1970”. Spatium (Belgrade), No. 34 (2015), pp. 1-9. (DOI: 10.2298/SPAT1534001A); Milašinović-Marić, D. (2012) Housing Design Model Within Unique Architectural Complexes in Serbia in The Sixties of 20th Century: As Model Forms of Harmonization Between Ideology an Modern Architectural Forms, in Mako, V., Roter-Blagojević, M., Vukotić-Lazar, M. (eds.) Proceedings from International Conference Architecture & Ideology, September 28-29. Belgrade: Faculty of Architecture University of Belgrade, pp. 549-556. ^ Jovanović J., Grbić J., Petrović, D. (2012) Prefabricated Construction in Former Yugoslavia. Visual and Aesthetic Features and Technology of Prefabrication, in Herold, S. and Stefanovska, B. (eds.) 45+ Post-War Modern Architecture in Europe. Berlin: Universitätsverlag der Technischen Universität Berlin, pp. 175-187. Wikimedia Commons has media related to Apartment buildings.